Another Familiar Face at 3-D! Focusing on another familiar Face at 3-D! Ryan joined our 3-D Team, last fall, with over 13 years’ experience; beginning in the engineering side of cathodic protection and eventually lead into the Ground Disturbance industry. He brings an enthusiastic, humorous personality to our team and is vigorously supporting and managing our Ground Disturbance Division. You can find Ryan pacing the hallways and offices while handling the overflow of One Call submissions and responses or frequenting the field doing what he does best. In 2009 he was introduced to the Ground Disturbance and Line Locating Industry where he was heavily trusted upon to audit Inspectors performing Ground Disturbance around hot lines on various projects and areas around the Provinces. In order to promote safe digging within these client’s organisations his main priority was assisting and directing them through the creation and/or design of their own Ground Disturbance Code of Practice(s). On top of his many years of Ground Disturbance training and education Ryan also currently holds his NACE tickets for corrosion protection and looks forward to furthering that knowledge while at 3-D. Safe digging and all aspects of performing safe Ground Disturbance has been exceedingly significant to his career and will continue to be for the countless years to come. When you get to know Ryan he has quite the fascinating pre-ground disturbance career as well! Before starting in this Industry; he spent majority of his time travelling the USA, Europe, Australia and most of Canada playing professional baseball. He continues to play occasionally in Edmonton in his spare time although his love of golf has filled up majority of that spare time he talks about. 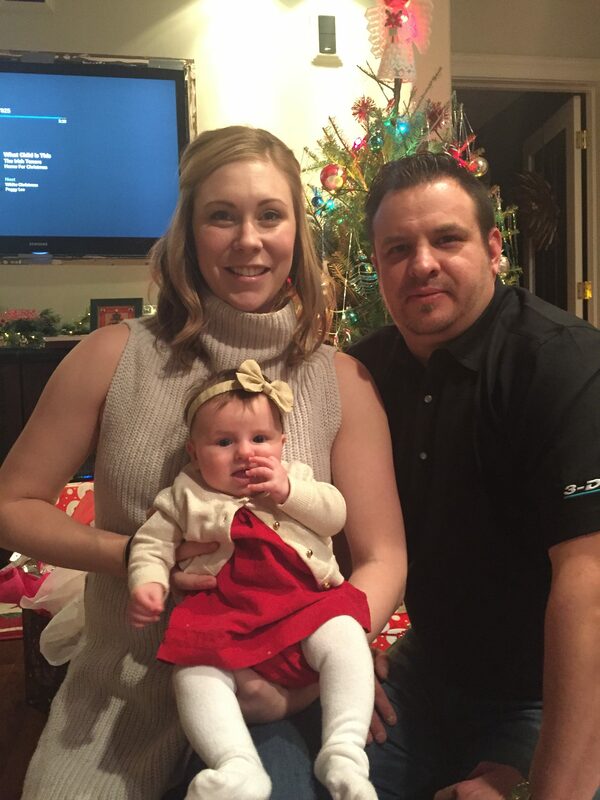 Ryan has a beautiful wife, Julie, of 3 years and recently welcomed their daughter, Harper, last September. We are more than excited to have Ryan on the 3-D Team and look forward to the many challenging, exciting years ahead together! 3-D Would like to welcome our newest Team Member! We are more than excited to have Dave Maguire join our 3-D Team as Senior Vice President. Dave joins us with many years’ experience in and around our Industry and is definitely not a stranger to many. Dave will actively manage our client accounts and assist in the growth and development of the company and it’s personnel. He is also known as one of the first gentlemen who gave Mike & Lindsay (owners of 3-D) a warm welcome and a head start to what grew to a valued work and personal relationship almost 7 years ago now. We wanted to introduce Dave to everyone and so we asked him to share his “story” with us! I was born in Winnipeg, Mb, October 27, 1955 and shortly after moved to Edmonton; spending most of my youth there from 1955 to 1969. I attended Lynnwood Elementary and 2 years at Hillcrest Junior High. After moving back to Winnipeg in 1969, I later became a Fort Richmond Collegiate graduate in 1973. I began working after one term, of Civil Technology, at Red River Community College. I began work as a rod man for a Land Survey company in 1975, progressed to a Crew Chief after 6 months and after a few years I returned to Red River Community College to obtain my Survey Technology Diploma in 1978. Happily married in the summer of 1978 I started working for Pollock & Wright Land Surveyors in Winnipeg. In 1980, I moved over to TransCanada Pipelines and worked on construction projects as a Regional Party Chief based at station 41 in Ile-des-Chenes, Mb. Over the next 10 years I was involved in several large diameter pipeline projects throughout Saskatchewan, Manitoba, Ontario and Quebec. My wife and I resided in Regina for 2 years and had 4 beautiful children during this period. We later moved to Calgary in 1990 and I began work at TCPL’s head office as the Survey Supervisor and later moved to Manager of Drafting. In 1996, I started Geographic Mapping Solutions Ltd. and Ted & Dave Custom Golf, where I worked a combination of pipeline survey projects, golf club manufacturing, repairs and custom fittings. In 2010, I started D. Maguire Survey Consulting Ltd. and worked for Stuart Weir as Manager of the pipeline group in Sherwood Park, AB. After a successful few years in the pipeline group, I then accepted the position of VP Utilities and worked up until August of 2016. Early in 2017, I accepted the position of Senior VP at 3-D Line Locating Ltd. and began working in January. I currently hold the responsibilities of managing client accounts and participating in the overall growth and direction of the company. I have been fortunate in my career to have my son and daughters work with me on various projects, along with many other people. There have been numerous relationships developed over the past 40 years that have been so important to my past and continued success. In the end; I have been an avid sports fan all my life, participating in hockey, baseball, skiing, golf and football. I spend most of my free time lately watching these sports either live or on TV. I still participate in golfing and hope to play a few rounds this summer with my new friends and family at 3-D Line Locating Ltd. Here at 3-D, we feel lucky to be surrounded by some of the greatest co-workers & friends during this holiday season! This year would not have been as successful without this group of amazing people! !